Since both sides have become hypercharged in a hypersensitive atmosphere, both sides fail to see the childishness of their own arguments. Personally, I come down somewhat firmly on one side of this debate: the so-called “pro-choice” side; yet, perhaps counter-intuitively, I couldn’t care less about a woman’s right to choose what to do with her body. The fact is that the woman and her baby are not analogous to a woman and her arm. The baby is not simply a part of her body. She bears responsibility for the life inside of her, of course. This argument becomes stronger the further along in the pregnancy the woman is. 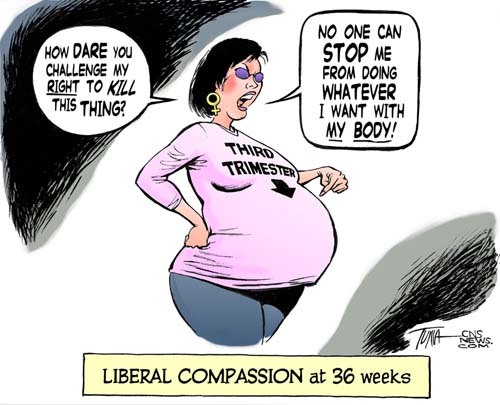 It’s hard to see why once the woman emits the baby from her body, she cannot kill it, but if it is inside of her, and has the ability to live outside of her, she is free to kill it. This would be the extreme, however. A third trimester abortion is something rarely performed unless the mother’s life is in danger anyway. However, this raises the question: where do we draw the line? I think almost everyone would agree that there is a point after which we cannot ethically terminate a baby (which is not a threat to the mother’s health), but it is much harder to say exactly when that point is. So, in all, given the choice between letting women do what they want to “their bodies” and allowing a life to be terminated, of course I will take away the woman’s right to do what she wants to her body. Now, before I get to why I am actually on the side of the pro-choicers, let me breakdown why the “pro-life” term is also ridiculous. Think about that term. Pro-life. What stupidity. 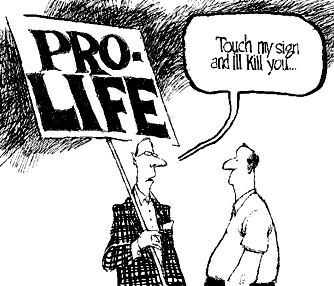 Who is not pro-life, in the greatest sense of the term, aside from psychopaths? This term is an ad hominem in itself. That’s a bad start. You’re labeling all people who disagree with you as psychopaths before the argument has begun. This is not an argument about who likes life and who likes death. This kind of thinking destroys any nuance that may be presented counter to abortion prohibition. Now, as for me, I don’t believe that abortion should be legal, as I said, because I care about a woman’s choice to do what she will with her body. This doesn’t have a big enough impact on society, in my opinion — and I believe that it is the purpose of laws to make a society run as smoothly and humanely as possible. Well, if you’re a pro-lifer and you’re banging your desk and screaming right now, just calm down for a second. I have not just contradicted myself. I believe abortion should be legal because when we look at examples around the world where it is not legal, we have to consider what happens. Does abortion just stop? Wow, I wish I lived in that world! No. It does not stop. It goes underground. It still happens, and it happens by boyfriends kicking their girlfriends in the stomach until the fetus or the mother dies, it happens by single mothers using coat hangers to hopefully puncture the right organs (I will save you the details. I’ll assume you can guess what I’m saying), it happens through quack doctors, or people who are not doctors at all, try to make a quick buck off a helpless would-be mother. This is a totally inhumane society, and one I am not willing to live in. For this reason alone, I am for the legalization of abortion everywhere. Abortion is an admittedly terrible procedure, but one which qualified doctors can perform with the lowest chances of error. This has nothing to do with being pro-choice or pro-life; it is simply the best solution to a hard problem.